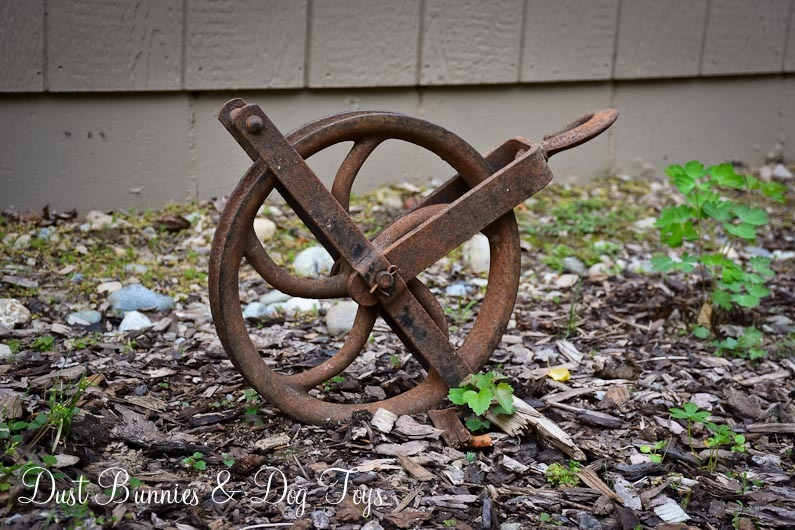 Today I’m sharing the fun new pieces of garden art I picked up at the Palmer Midsummer Garden & Art Faire I told you about yesterday. 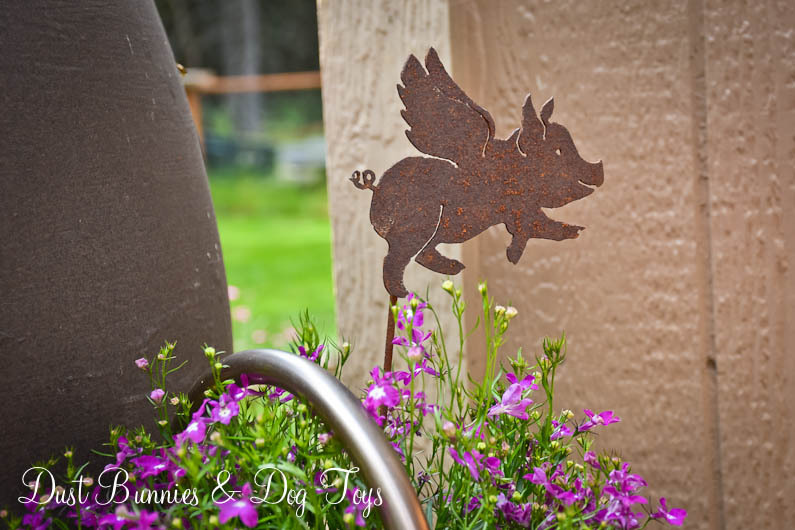 One of my favorites is this little rusty flying pig stake. At $10 he wasn’t a bargain, but I couldn’t say no to his cuteness. 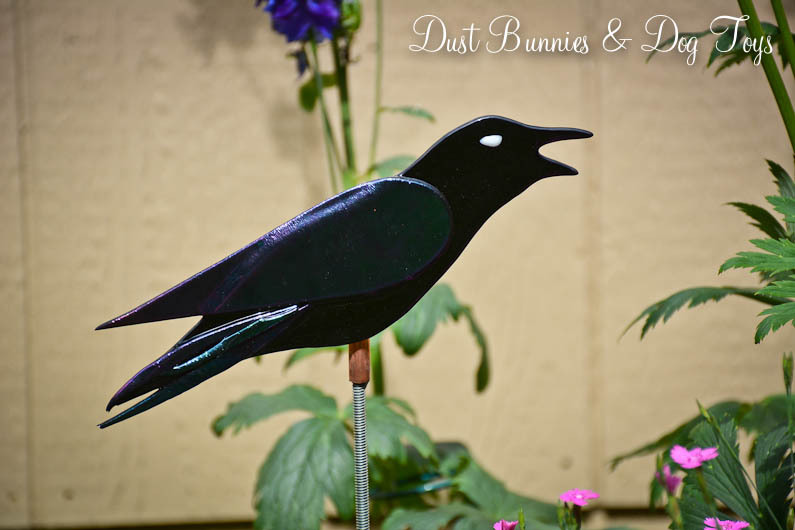 He’s a perfect fit for our farmhouse style, but his wings give him just the right amount of whimsy for the garden. 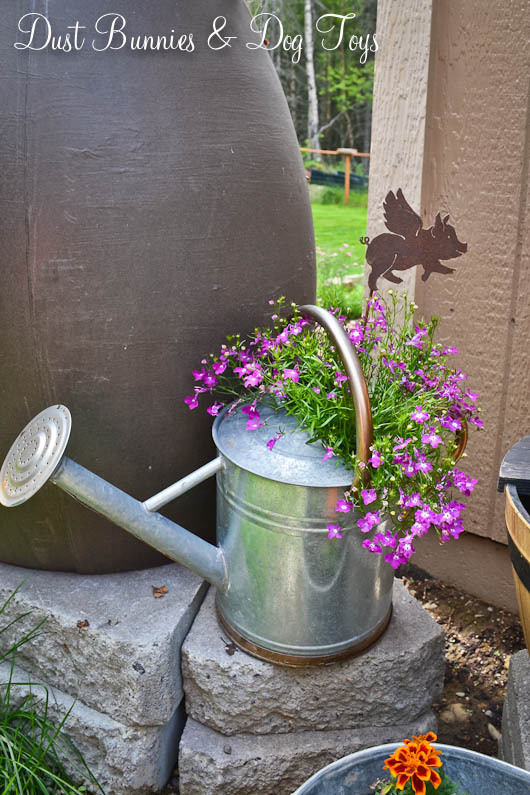 I put him in the watering can planter which provides the perfect launching point for him over the pink lobelia. 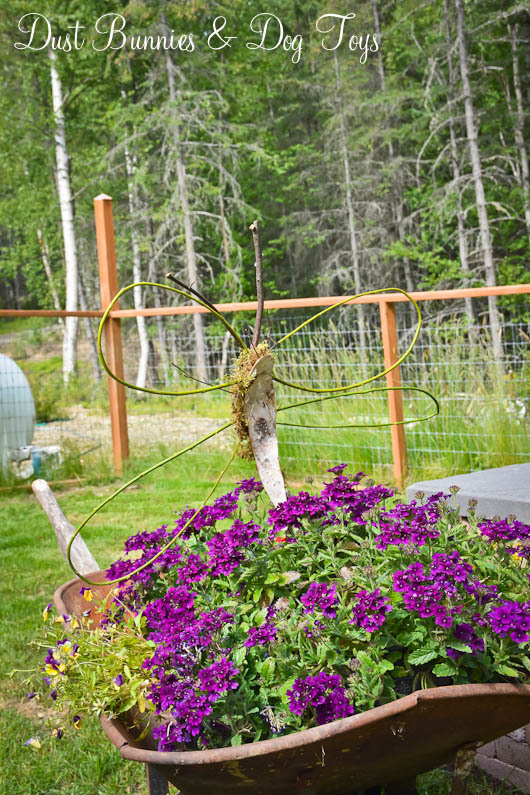 If you were paying close attention last week when I shared our septic pipe disguise project you probably already saw the willow and birch dragon fly I added to the wheelbarrow planter. I’ve got a few other dragon flies around the garden – including some very large live ones! – so he fits right in. The vendor making them had larger versions available for $15, but I spotted this guy as part of an arrangement and knew he’d be better sized for where I wanted him. Luckily, I was able to get the vendor to agree to break up the arrangement and sell him separately for just $5, which I thought was a fantastic price! This glass crow is probably my favorite find from the faire and was also the first I bought that day. I absolutely love the iridescent colors on his wing and tail that catch the sunlight. He was only $20, which I thought was an amazing price, knowing the skill and time glass work take. The vendor also had other designs as yard stakes and wall hangings. I told him if he makes puffins and salmon as yard stakes in the future I want to add them to my garden. 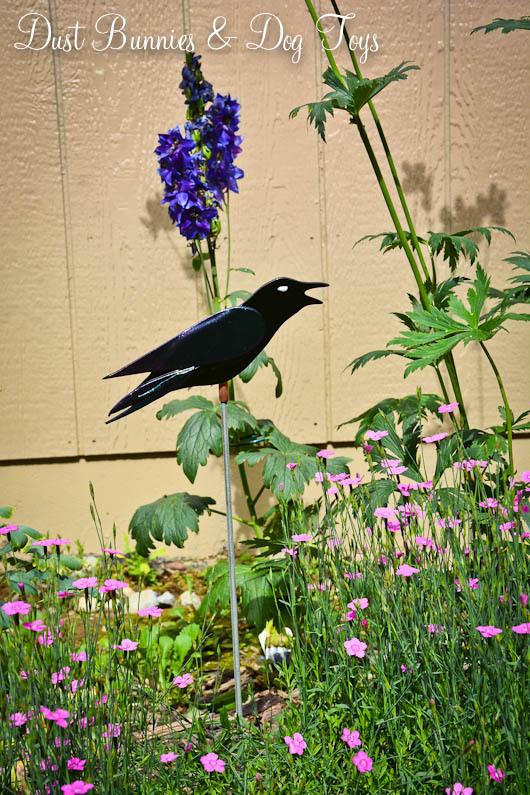 I may eventually paint Mr. Crow’s stake a dark color so it blends in a bit more, but for now I love how he’s perched over top of the dianthus. Even the Hubs commented on how he looks good there! 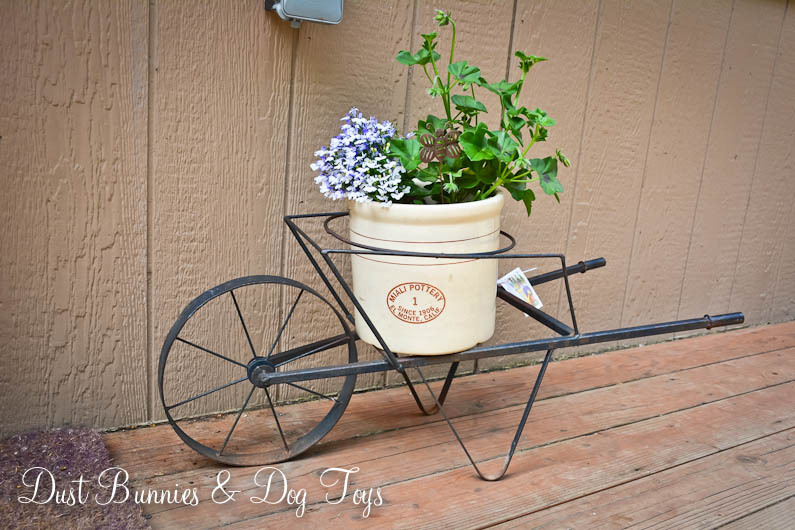 And lastly was this sweet metal wheelbarrow planter I scored for just $16. It turned out to be a perfect fit for the crock I already had on the deck. Now that I know it gives the crock good height, I’ll pick something that trails down the sides for this planter next season! 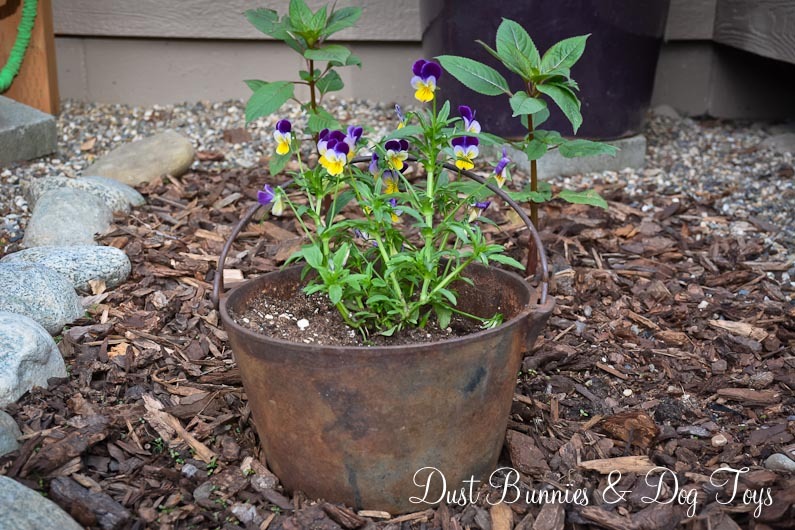 Notice that little rusty bee in the crock? That’s a bit of garden art I DIY’d. I did a few others as well which I’ll be sharing soon, so watch for that. 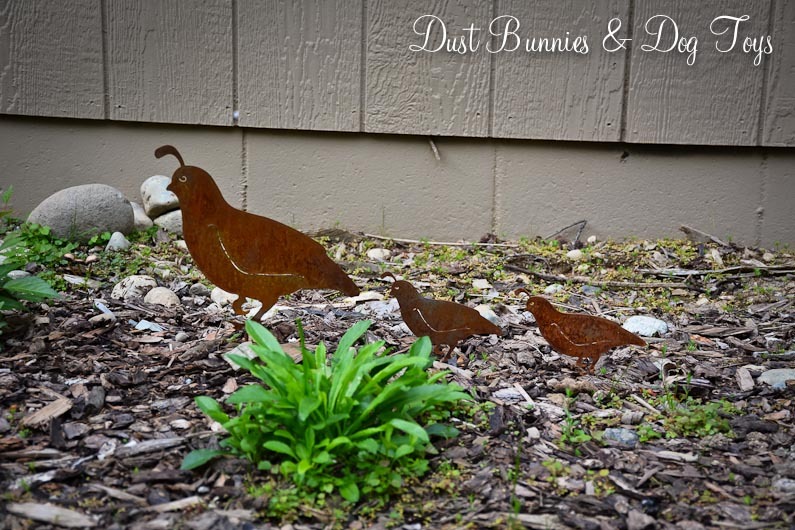 Until then, I’d love to hear what you think of my garden art haul from the faire, so leave a comment below. So it should come as no surprise that I’m a huge fan of the show Fixer Upper, and if you’ve watched it at all you know Joanna Gaines’ penchant for using windmills as wall art. 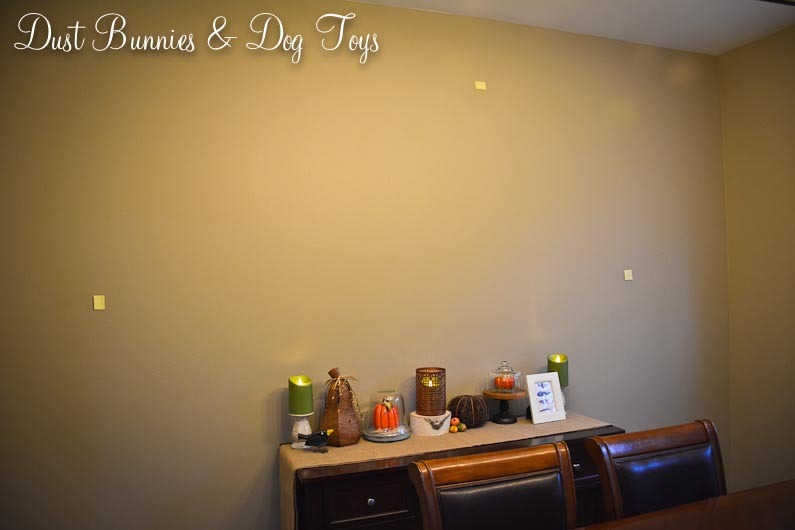 I loved the look and decided to make the same happen in our home. Luckily, we have a fantastic local antique store who does picking trips across Canada and the lower 48. So when they asked if anyone was looking for something in particular I made sure my request got on the list. It must have been fate because they found one in Wisconsin! Unfortunately they didn’t have room to bring it back that trip, but they were able to store it at a partner’s warehouse until the next trip when they cut it in half and wedged it into the trailer with all their other found treasures. Usually they have a big one day sale a few days after they return from each trip where the items they pick are available, but since it was a special pick just for me, I got to come pick it up as they were unloading. It’s definitely a large scale piece, measuring about 8′ wide and 4′ tall! The picture above is a shot of it on our big flatbed trailer in the yard. It’s so large that I had to take the photo vertically and rotate it because I couldn’t get high enough to fit the whole thing in the frame! Although they brought back the better half for me, it is missing half of two of the blades, but because they are in the center it doesn’t bother me much. 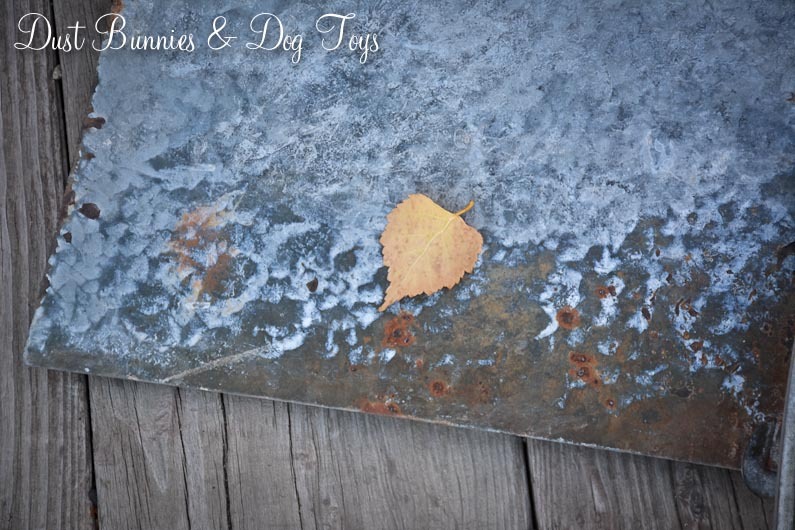 And how can you not love the amazing patina this thing has?! The plan is to mount this massive piece of rustic art on the dining room wall, which I’ve cleared in preparation. The small yellow stickie notes are an approximate of the size for reference. I’d like to have a white plank wall (another Fixer Upper inspiration) behind it so that has to happen first because I have no intention of making the hubs help me move and mount this mother more than once. He loves me, but I’m not sure he loves me enough for that! 😉 I’m hopeful that we’ll get that done before December so I can clip all the holiday cards we receive to it, but life might get in the way of that, so we’ll see. For now I’ll just envision it there above the buffet, which includes a sneak peek of my fall decorating that I’ll be sharing soon – including a few DIY revamps! I’ll be sure to share both the plank wall install and final look with the windmill in place, so stay tuned! Welcome back for part two of how we’re using the cool ‘junk’ we picked up on our recent vacation. 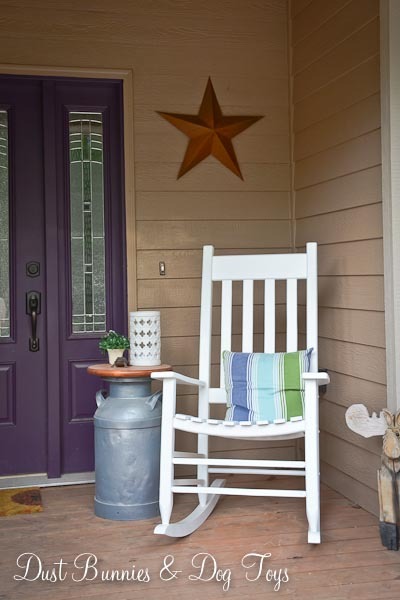 Here’s where things ended up outside along with a little garden update while we’re at it. 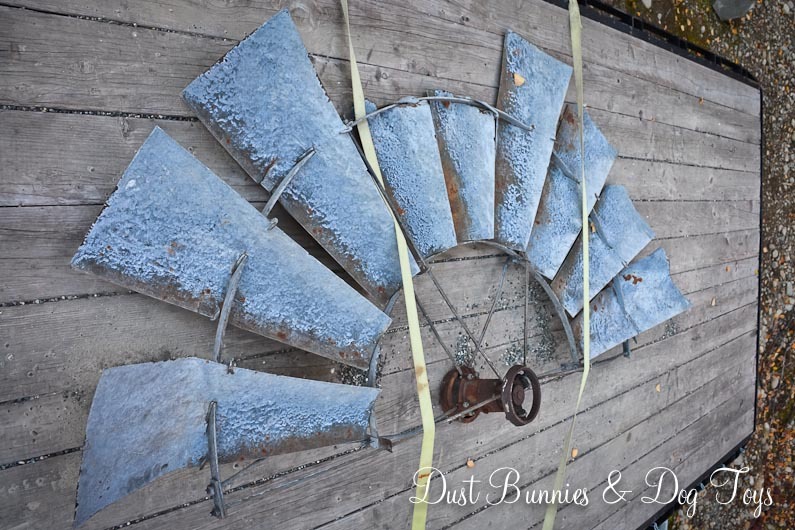 The big rusty metal star the hubs picked out at the junk show for $18 had to be hand carried on the plane. We were sure it would be considered a weapon thanks to the top point sticking out of the only bag we could find that kind of fit it, but TSA said as long as it went through the scanner it was ok. I’m very glad it made it through because it looks fantastic on the front porch! Nearby, the cool metal excavator I found for $20 found a home in the front flower bed where it appears to be digging up spots for more plants. It’s definitely something you won’t see in everyone’s garden and that’s just what I like about it! 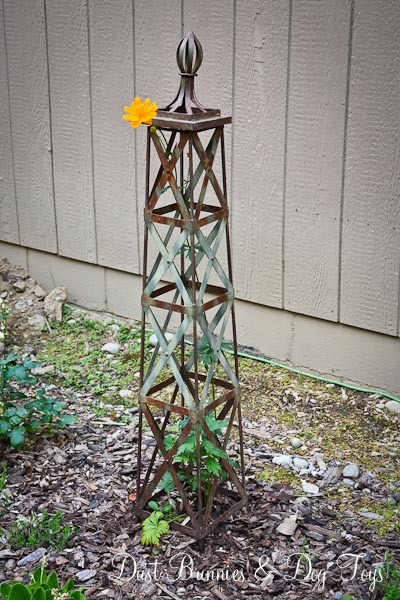 Several items ended up in the gifted garden including the cool trellis the hubs surprised me with. 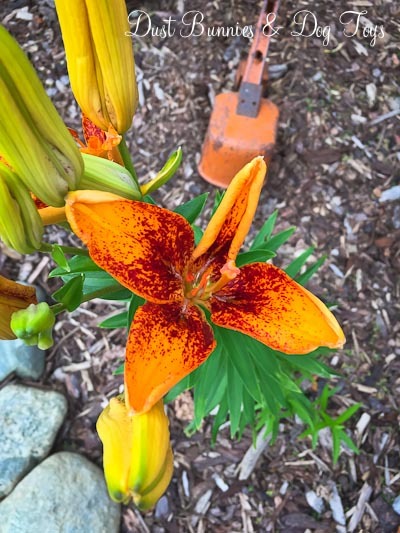 It works perfectly for the troilus that started blooming soon after we got home. I still can’t believe this piece was only $23! 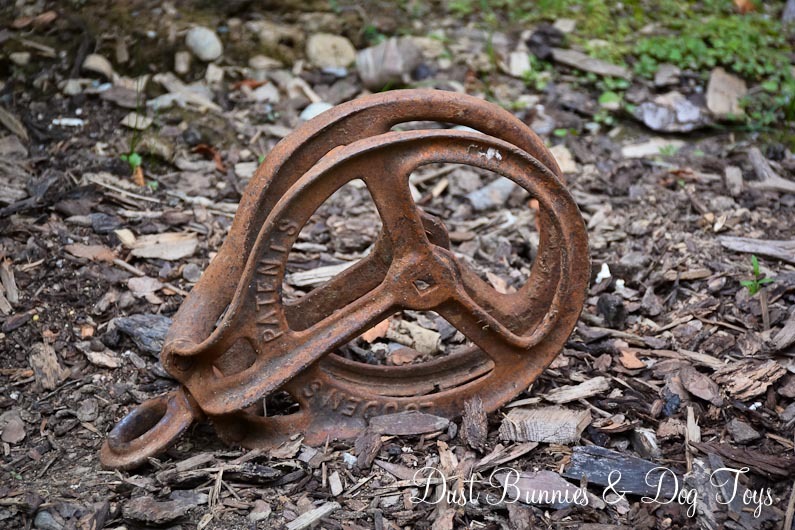 The trio of rusty pulleys we got for $10, $20 and $30 are the perfect “dog proof” garden art. They have since been knocked over by those energetic fur balls, but ‘eh – it makes it look more authentic so oh well. 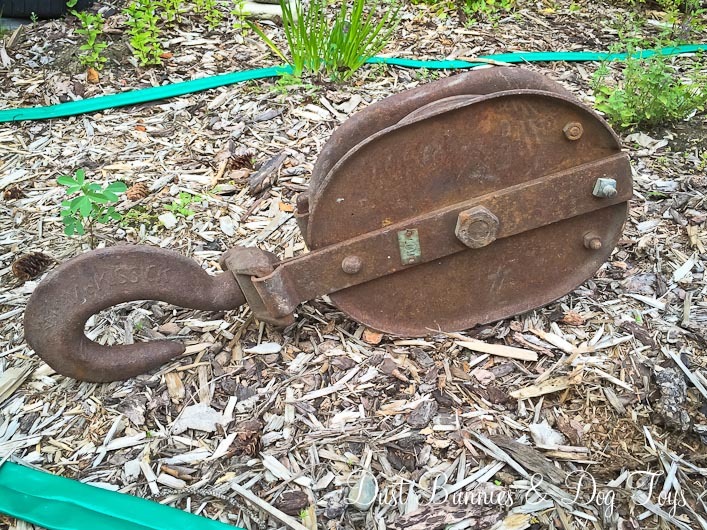 We also picked up this massive pulley at an estate sale last weekend for just $25. I love the little number tag on the side! It’s found a home down in the rain garden. My last find of the day at the junk show, a cast iron campfire cook pot now holds Johnny Jump Ups the neighbor brought over. I admit this picture is a week or two old because those plants behind the pot are now massive! They were also gifted to us by the neighbor but I have no idea what they are. They sure seem to like this spot though, because they are 5 times this size now! 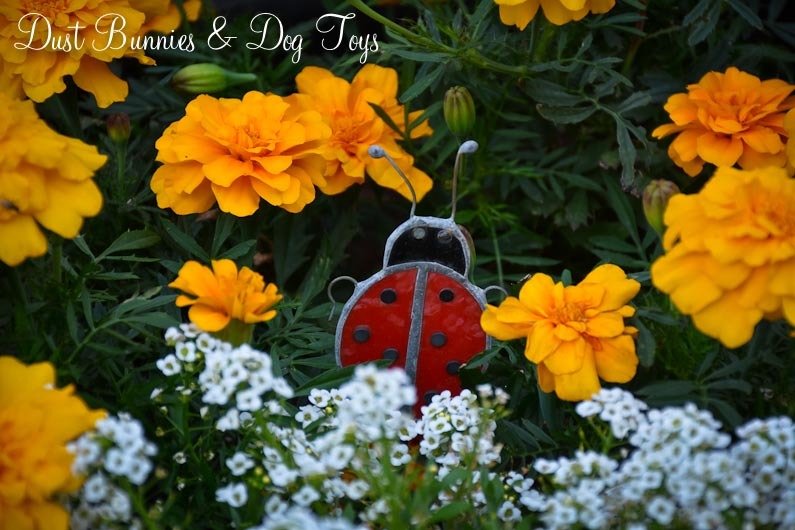 This little stained glass lady bug – an appropriation from my sister’s garden – now adorns my marigolds in the front yard. He’s so cute I might have to make a few more, and possibly do some dragon flies and butter flies while I’m at it! Beyond the junk things are still blooming. 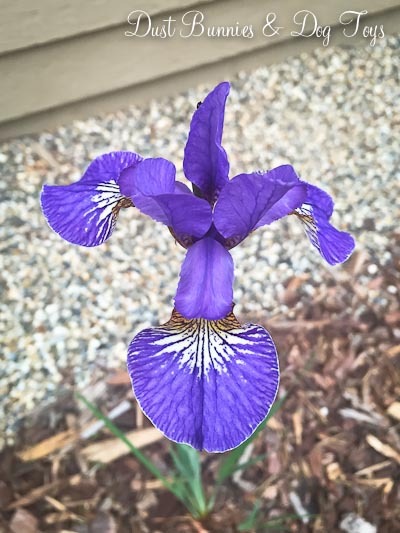 We got home just in time to see the iris, which I was so happy about. 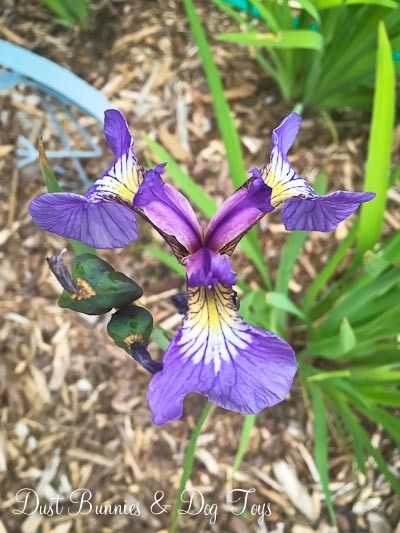 I have a few varieties including water iris, wild iris and arctic iris. They each have slightly different colors and leaves but they’re all beautiful to me. 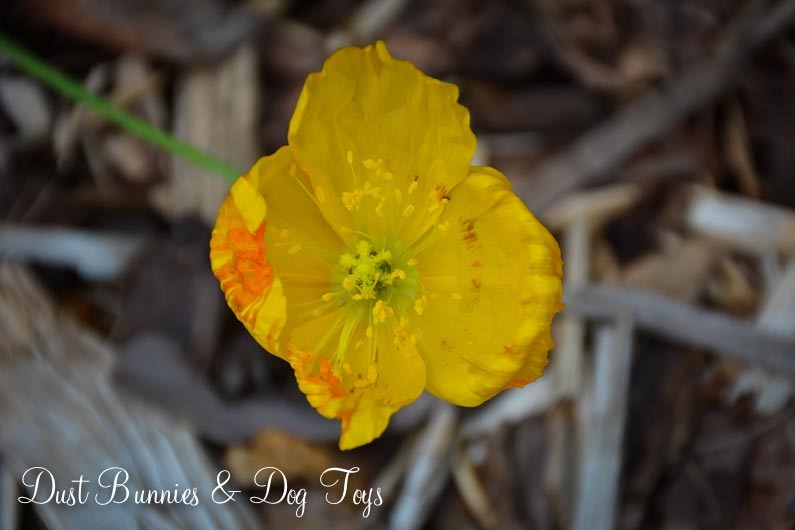 We also have a few poppies blooming. These were another gift from the neighbor – have I mentioned how much I love having a gardening neighbor?! 🙂 The fact that I’ve done nothing to them and yet they seem to be doing quite well makes me even happier. 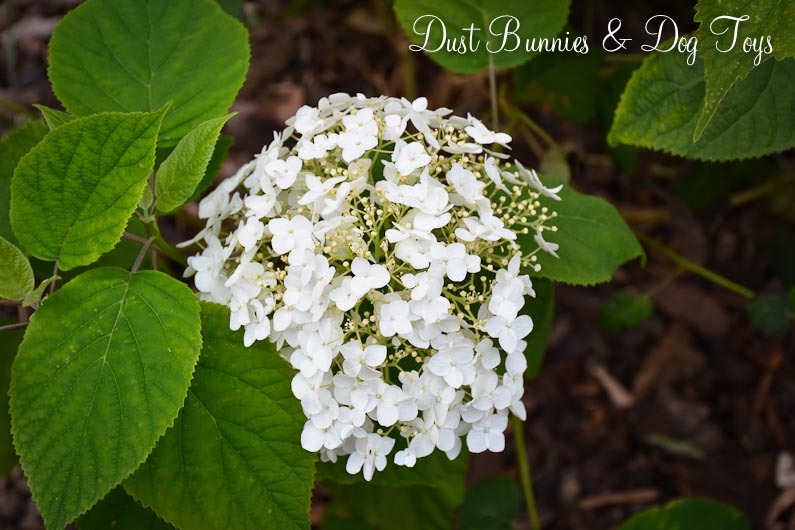 The hydrangea I planted this season is also blooming! 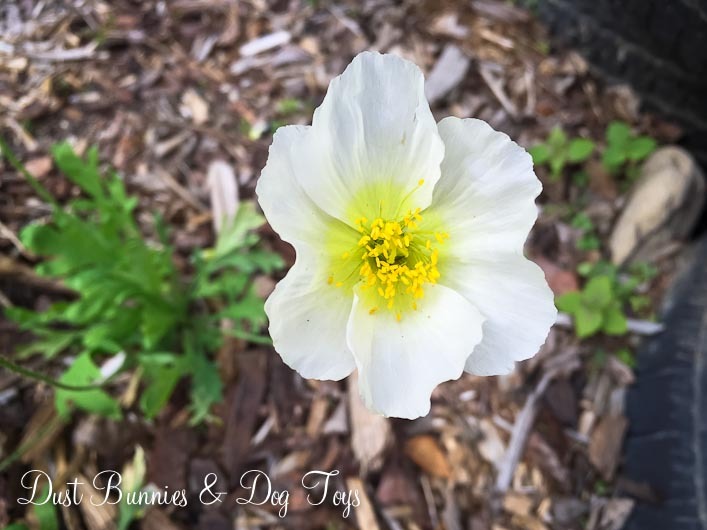 I’m so excited to have this one establish itself and grow bigger and bigger each year. The blooms started out pretty small but now they are almost full. I’m torn between cutting some to bring inside and letting them continue to grow. Thus far I’ve just let them grow, but as the season wraps up I might go ahead and snip a few. I do need to add a little support for it though since the back side seems a bit heavy for the thin stalks. I’m thinking one of those large rings might work well since it’s not very tall yet. 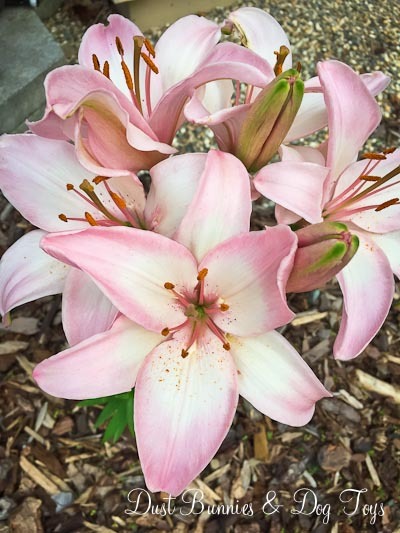 My lilies are also making an appearance after teasing with tightly sealed buds for weeks. 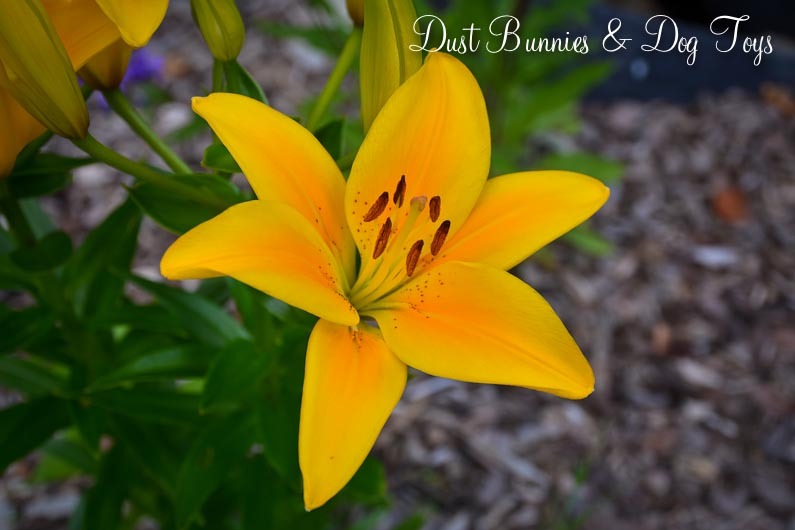 I have several varieties of these as well including pink, orange and yellow. I made sure to get a few shots of them to enjoy right away since I know they won’t last long. 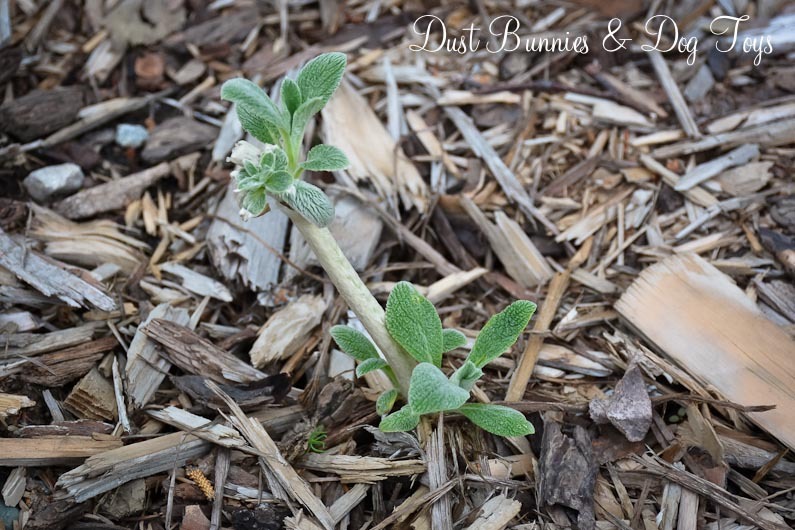 The lambs ear I brought back from my mother-in-law’s yard is doing well in the rain garden. It’s certainly not going gang-busters, but it’s green and healthy after an overnight trip in a ziplock baggie on a plane, so I’m not going to be too critical. 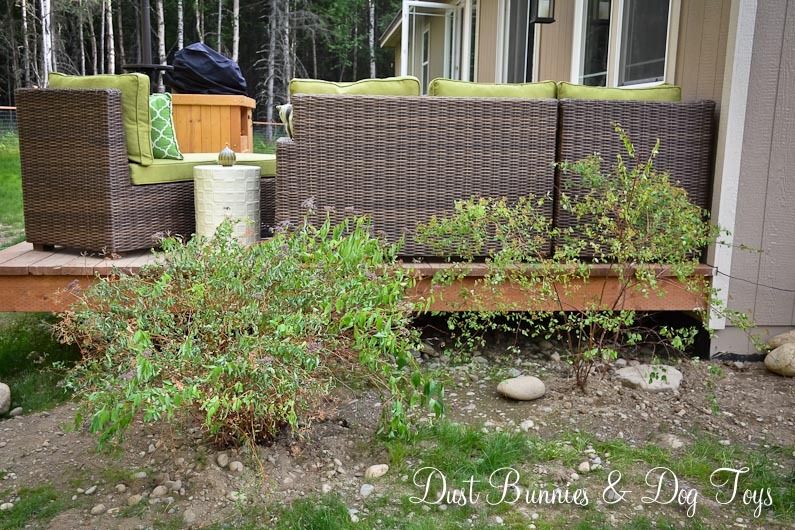 I added some bushes I got for $20 on the buy/sell page to the side of the deck to get that landscape started. 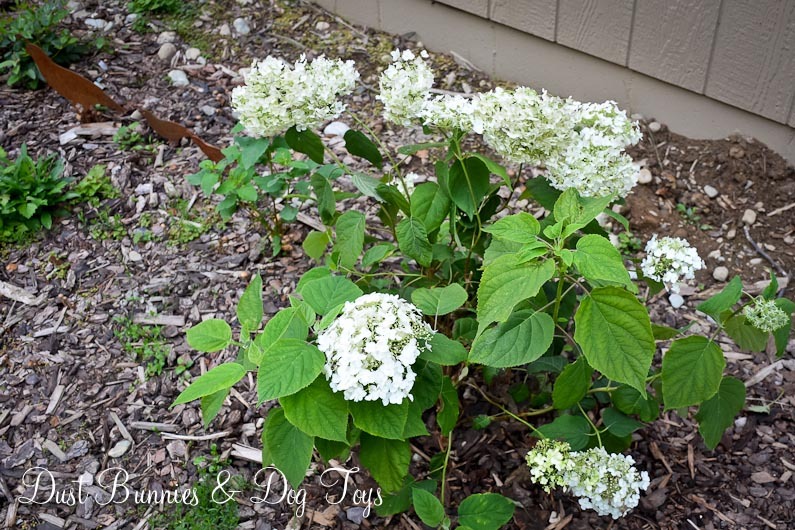 I don’t remember the names of these right now so I’ll have to dig the tags out of the gardening cabinet, but I believe they are both varieties of spirea. 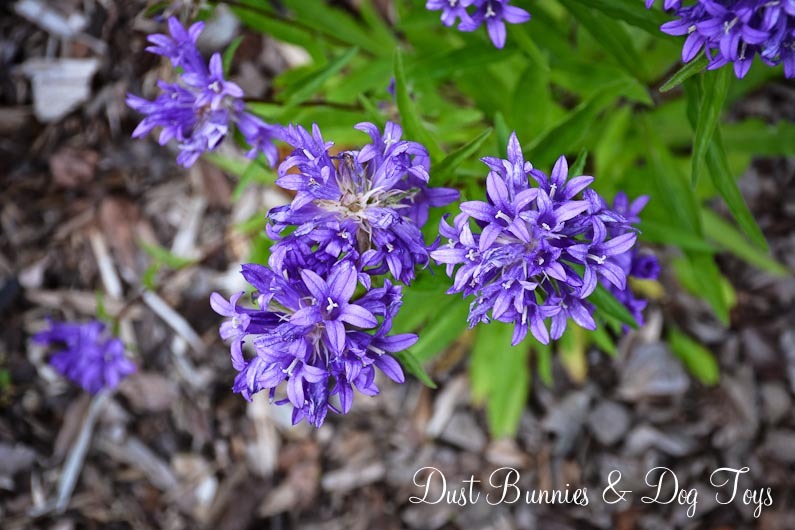 The one on the left gets pretty purple flowers and the one on the right has small white flowers. 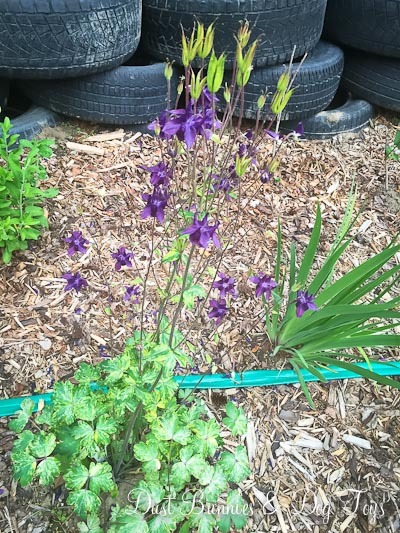 My Columbines are doing well, both in the rain garden and the gifted garden. And after some pretty lush leaf growth all season the campanula is finally blooming. 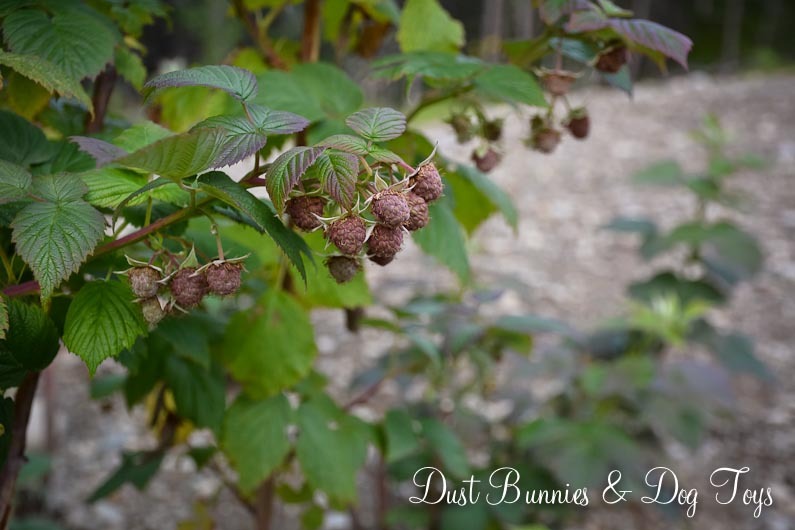 My freebie raspberries are slowly getting established, so I’m just letting them be for now. But there is a potential harvest this year if these little guys come in a bit more and ripen! That is of course if I can keep this big boy out of them! 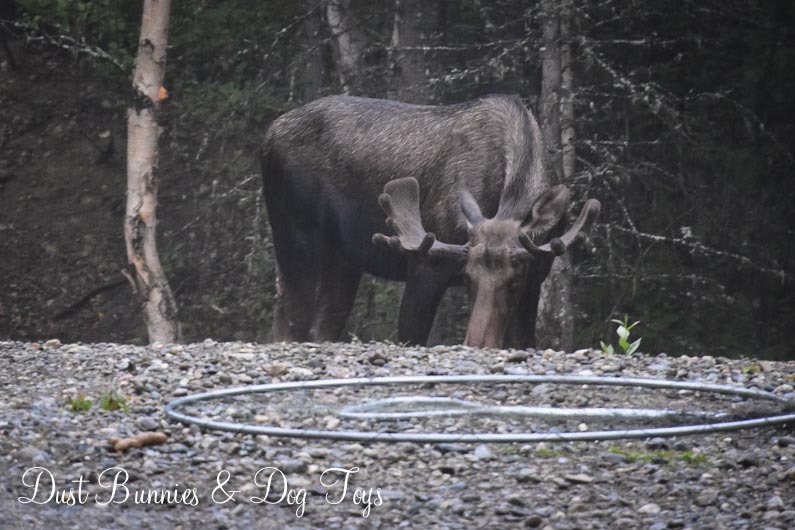 He stopped by the other night during a huge downpour and thankfully seemed more interested in the weed patch just in front of the raspberries. Good thing I haven’t been able to keep a super tidy landscape yet! 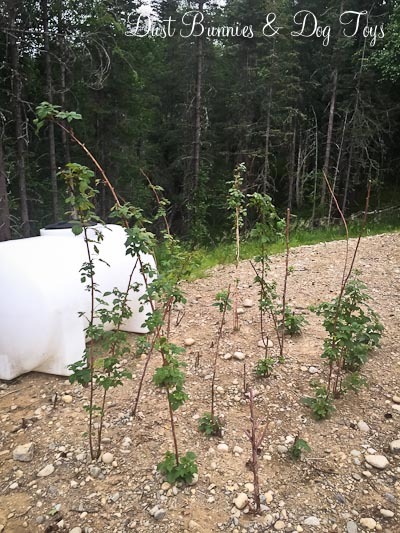 Luckily, the raspberries are close enough to the back yard fence that the dogs typically keep the moose at bay. So that’s how we junked up the yard. 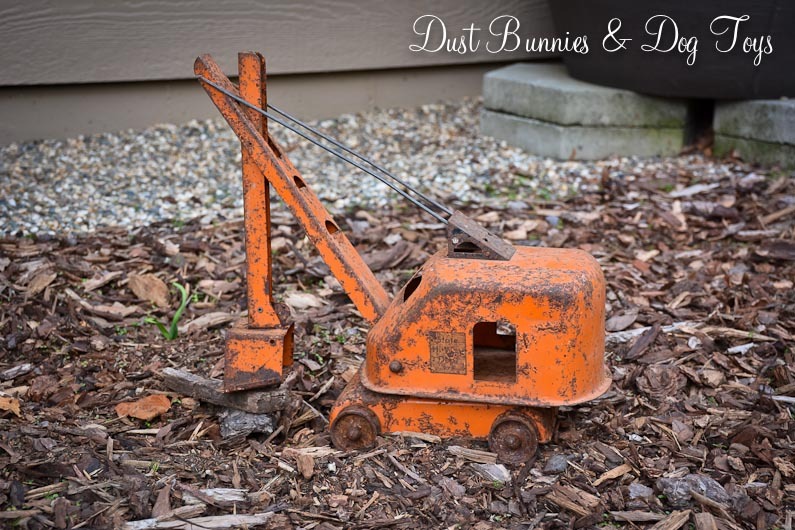 Do you have ‘junk’ in your gardens? I’d love to see it, so share a photo or a link below!